This image received a textures treatment, using some of my handmade textures and a little “brush” work, so it resembles a painting. 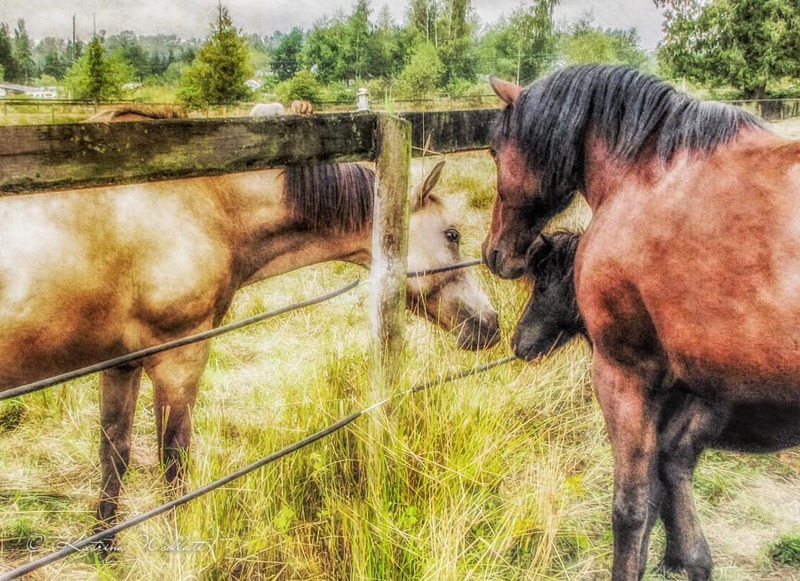 The image shows Oporto (at the front) with his mini-horse companion greeting a new arrival. 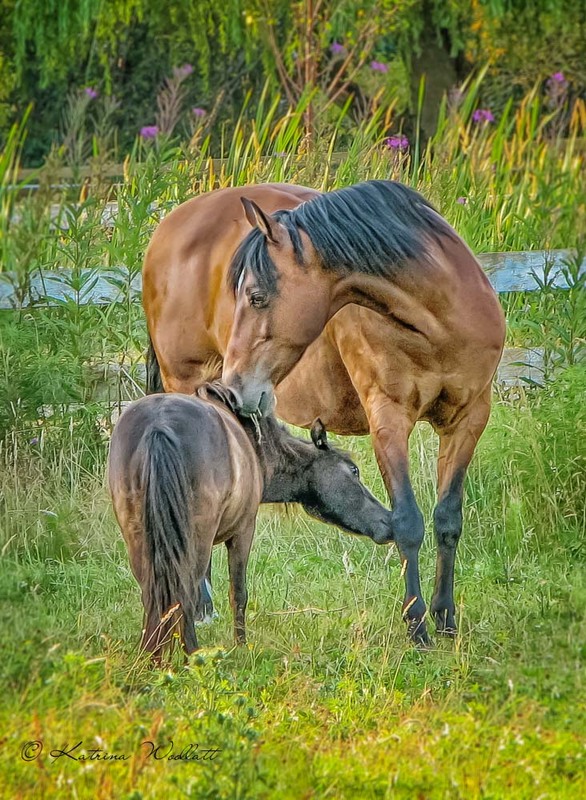 Still learning to be a gelding himself, Oporto was helping the bratty little mini ex-stallion adjust to being a gelding. He took his job very seriously…the mini would grab a mouthful of skin and muscle and hang on, and feisty Oporto would just grit his teeth and try gently to brush him off. The mini was also good at escaping from their field, which would worry Oporto until he knew that I was aware of the escape, at which point the problem became mine and he could relax. His relief was always palpable. The mini would visit other horses in adjacent paddocks. Not all of them liked him, so Oporto’s concern was justified. Here everyone is being polite and sociable. Time for Monochrome Madness again. I thought I’d offer a complete about-face from last week’s high key, minimalist image. It shows Oporto and friend having a thorough mutual grooming session in a tree-shaded corner. Click here to head on over to Leanne Cole’s blog to check out all of Week 33’s great black and white images. 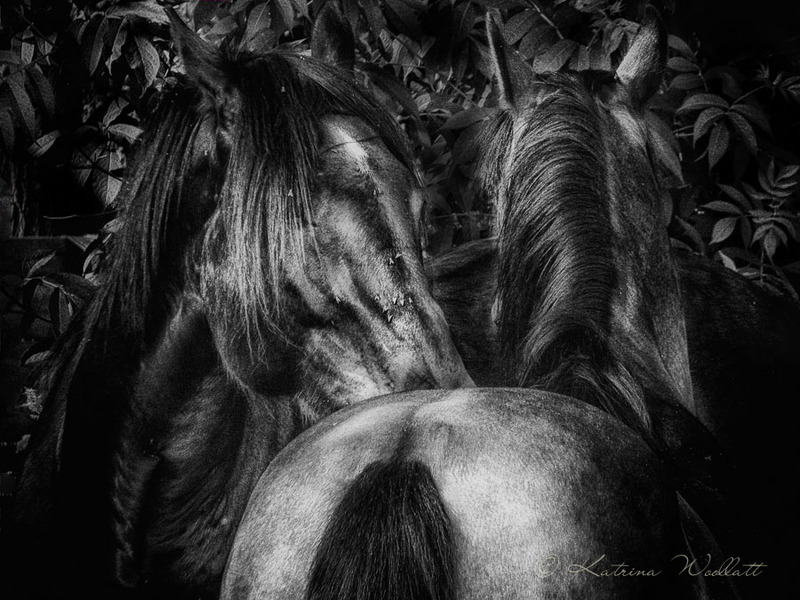 Altho I originally started this blog with the idea that I would show my horse images, with the exception of the monochrome horse eye image (click here to see it) the few that I have posted haven’t been among the most popular, so I have held them back. However, I know I have at least 3 horselovers among my regular viewers so this one’s for them (and me). It’s my late horse resting in the morning sun. I have several images of him in this location because when the sun was out in the mornings the reflected light was always so fantastic, bathing everything in a warm glow. 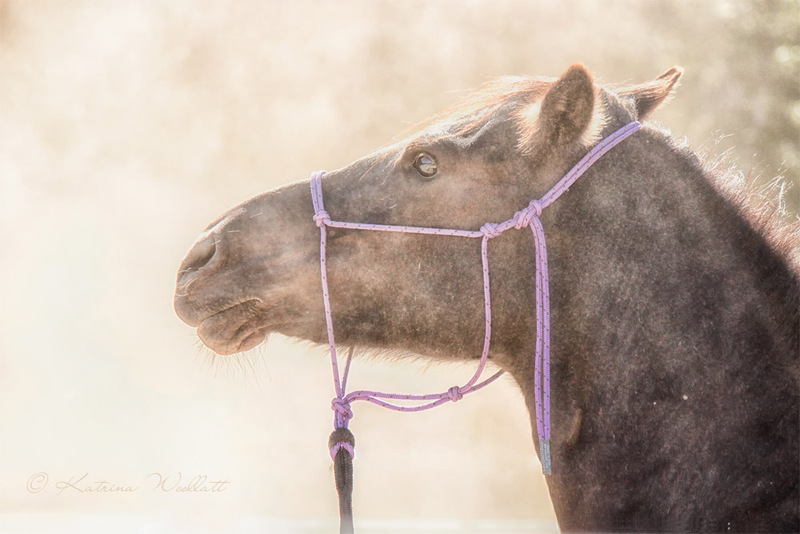 Horses are my favorite subject so here’s the first of my horse images. 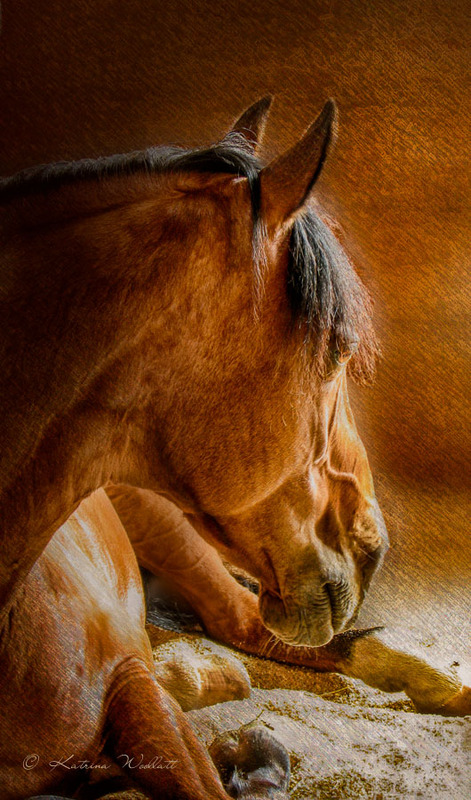 The image below was taken at a riding workshop where the footing was very dry and dusty. All I did in the way of post processing for this image was basic contrast adjustment and a little dodging and burning. I liked how the sun shining through the airborne dust made a nice, soft background. While visiting a friend I watched one of her young cats playing in one of the horses’ tails. The mare seemed totally unconcerned about having a mischievous feline wrapping herself up entirely in the tail, rolling around in it, and threatening to get completely tangled up in all that hair. But no problem, the mare just rested there until the cat lost interest. If you like the content of my blog I invite you to enter your email address to follow mythical horse and receive notifications of new posts by email. 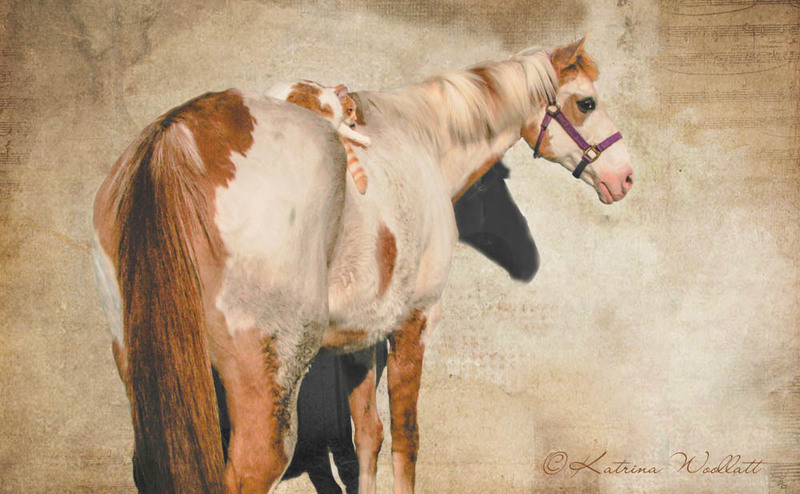 All images are copyright © 2014-2015 Katrina Woollatt. All rights reserved. Images on this blog are not Public Domain unless stated otherwise. Exploring life one frame at a time!